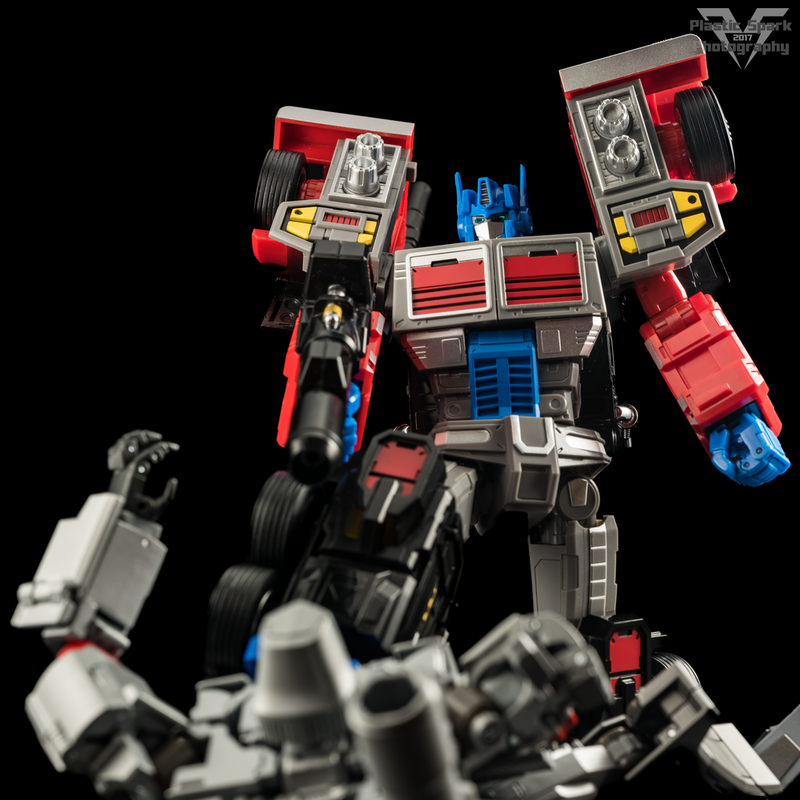 Fans Hobby is a fast up and coming name on the third party scene, with a couple of phenomenal releases under their belts already in the form of their Masterpiece style Monster Bots; Fei Long and Megatooth as well as the original Gunfighter and Arch Enemy. 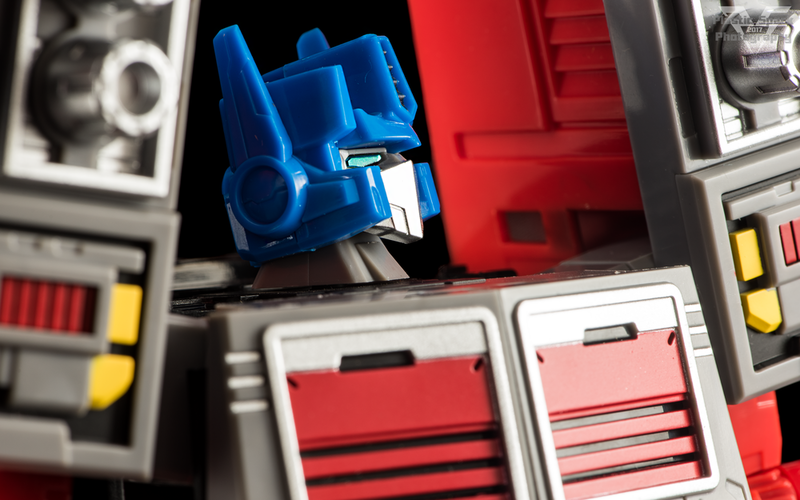 They were very kind to reach out to me and provide me with a production sample of Gunfighter II, their G2 Laser Optimus Prime homage, to photograph and review and I am eager to share my thoughts with all of you! Please keep in mind this is a production sample sent out for review, and while it does feel very near completion, some changes may be made before final release. Gunfighter II is currently available for pre-order from your retailer of choice or directly from Fans Hobby themselves with an estimated release window of June 2017! 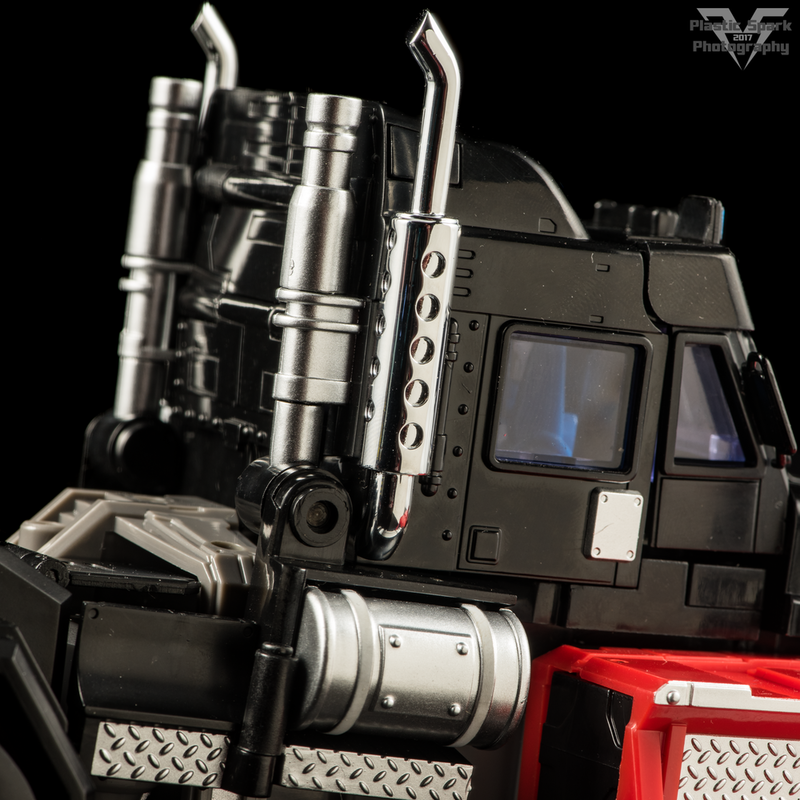 Gunfighter II’s alt mode is an aggressive, powerful looking truck with a ton of detail. 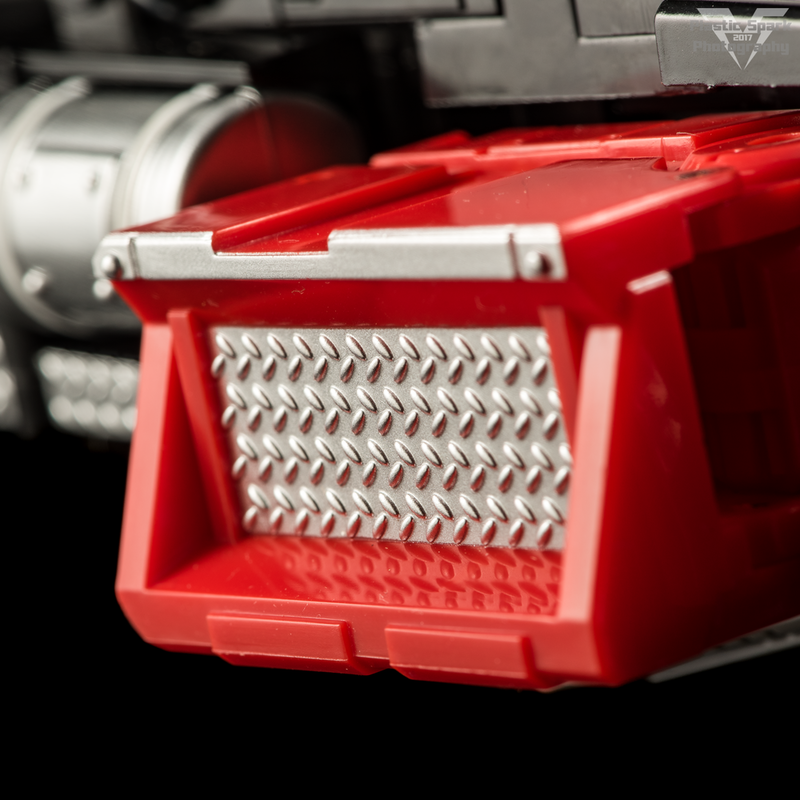 Fans Hobby went the extra mile to make sure that every little detail was included from the rims, to the diamond plating, and even the marker lights. The truck mode rolls very well and has great ground clearance with nothing scraping on the ground. The tires are rubber, the rims and smokestacks are chromed very nicely, and there is a nice semi-gloss finish to the whole figure that gives it a premium feel similar to the official MP line. There are a few seam lines in the obvious places but the figure looks very cohesive and does not have a puzzle piece look to it. Fans Hobby even went the extra mile to add sliding panels hidden in the rear of the thighs to help hide the hip/thigh area while in alt mode. 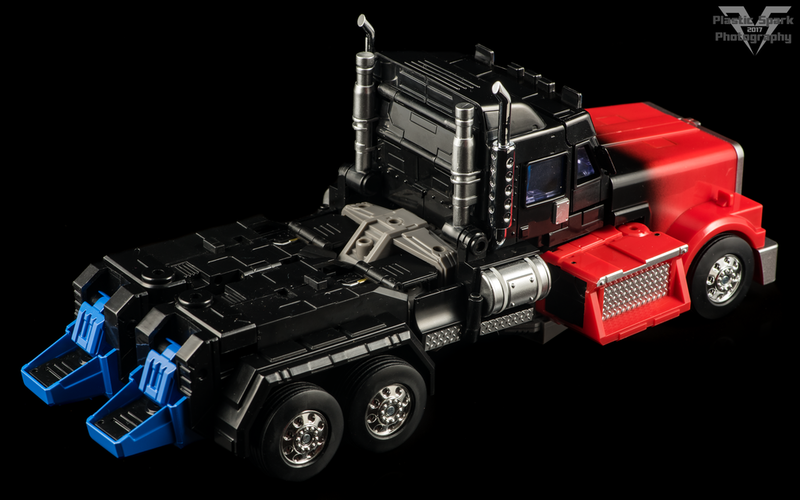 I would have liked to see a little more attention paid to the arms/running boards as they stick out a little bit too far in my opinion and are probably the least streamlined component of the vehicle mode. The fading red to black paint job is a great tribute to the original toy and very well executed. It looks incredible both in hand and in photos. The vehicle has weapon storage options on the rear, to have either of the included blasters mounted one at a time in place of a trailer. There are also 2 small rotating panels in the hood, meant for robot mode weapon storage that can also be utilized to create a G2 style attack mode by mounting both of Gunfighter’s firearms to the hood. There is no available storage for the sword. 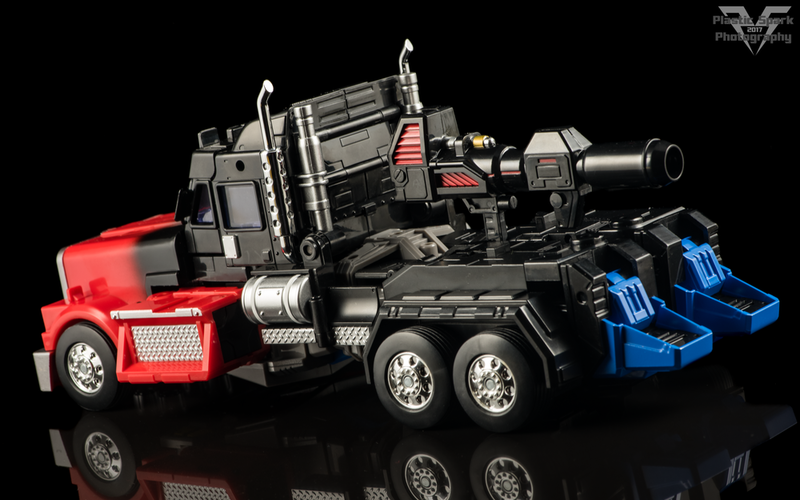 Some aesthetic changes have been made in vehicle mode for Gunfighter II. The addition of a center support in the windshield, windshield wipers, and indicator lights on the front fenders, as well as the sliding covers hidden in the robot mode thighs. It would have been nice to see a trailer included with this release, as I know Fans Hobby have a trailer in the works. Given that the trailer doesn’t contribute to the robot mode I suppose it is nice to be able to just purchase the bot and save the display space. 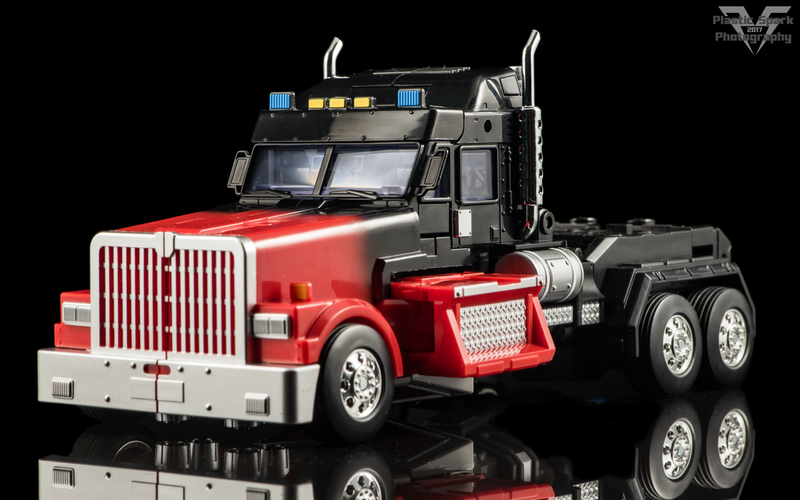 I know my MP-10 Trailer is in the way more often than I use it but at the same time it would have been nice to see as the alt mode of these trucks always looks a bit naked without the trailer. From what I understand it will be available down the road for those who wish to add on. Transformation to and from robot mode is simple, and satisfying. I only had to refer to the instructions at one point for some of the finishing touches, mainly sliding the wheels in to proper position. This is absolutely a figure that you can pick up and transform intuitively in a couple minutes and it does not feel like a chore. I genuinely enjoy transforming Gunfighter II back and forth and have done so a few times now. 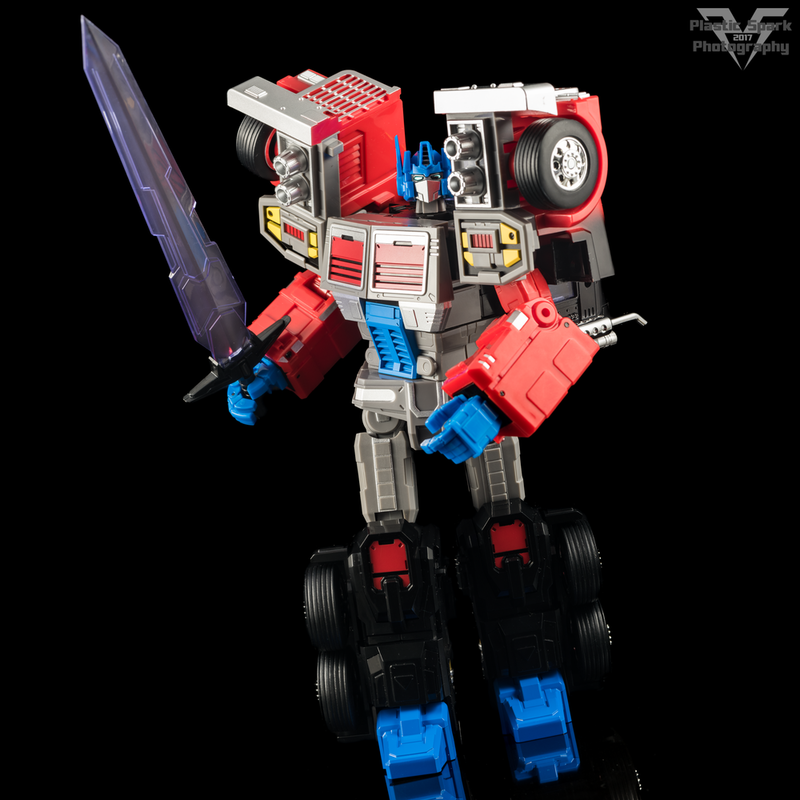 The transformation is very comparable to Takara MP-10 Optimus Prime in the best ways. I love the addition of locking mechanisms in the legs, just be sure to press in the locking button before attempting to collapse the legs. Gunfighter II is an absolute bruiser of a bot, with heroic proportions and gigantic intimidating shoulder pauldrons. I have always been a big fan of G2 Prime's look and I am absolutely in love with how this figure interprets the design. 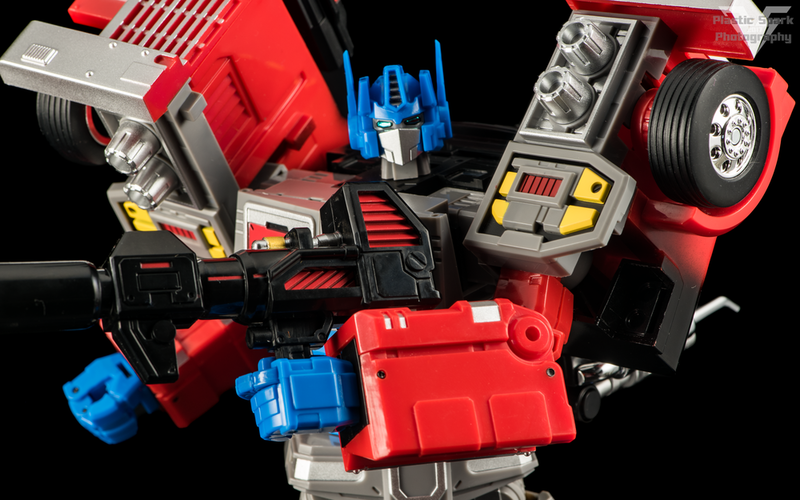 Fans Hobby have done an excellent job of turning the G2 Prime design into a Masterpiece style figure, with just the right amount of surface detailing and paint to feel fresh, and fit in to existing MP style displays. The head/face in particular is absolutely stunning and the use of metallic paint for the eyes gives the figure the feeling of life even when he is just standing on a shelf. Head sculpts are sometimes where third party companies stumble but this is an absolute triumph! Gunfighter II stands just a hair above MP-10 Optimus Prime at the head, and with the addition of his armored shoulders he has a presence that really makes Prime feel small in comparison. This is an Autobot leader that is not going to take kindly to Megatron’s nonsense, and in fact he even makes the new MP-36 Megatron look small in comparison. 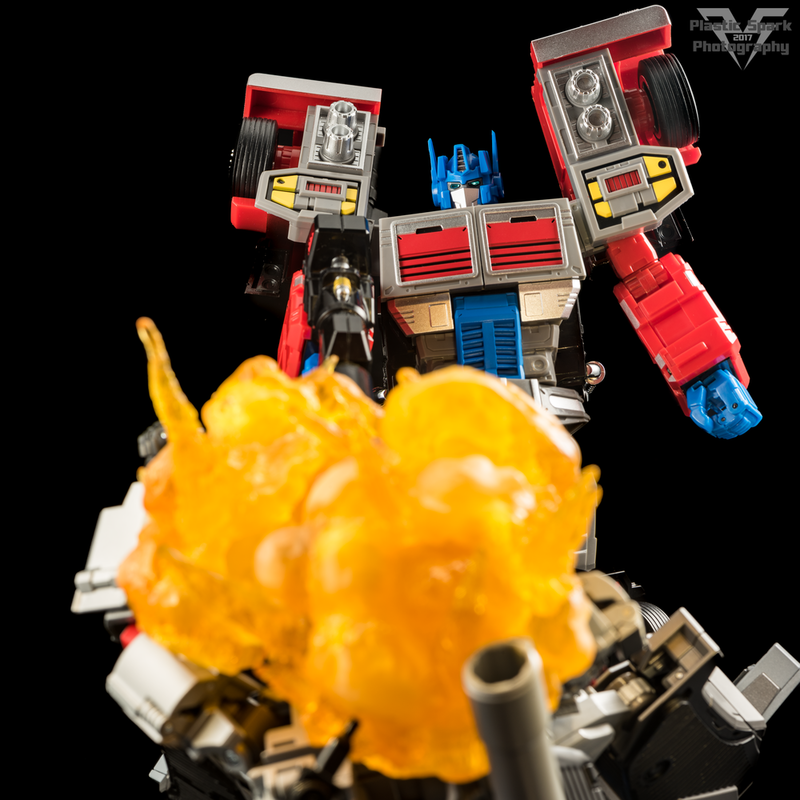 Gunfighter II has an awesome presence and I love the way Fans Hobby has been able to capture the no-nonsense, take no prisoners attitude of G2 Prime. 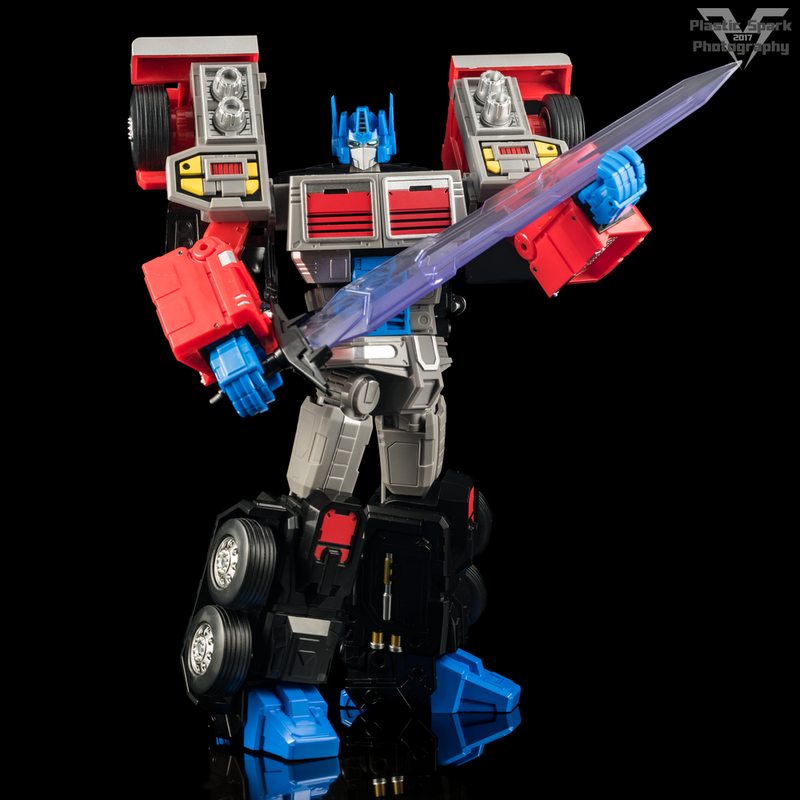 He looks incredible with the existing G2 Masterpiece figures as well like MP-12G Sideswipe! Articulation on Gunfighter II is quite impressive, with only a few limitations that are mostly due to the base G2 design that he is based on. From the top down he’s got a 2 axis neck joint allowing for full 360 degree rotation and a health amount of up/down movement. His shoulders are on a series of ratchet and friction joints; 1 joint embedded in the chest, used for transformation can be used to move the shoulders up/down to your liking or to accommodate certain poses. This stalk can also slide in/out of the main body to widen the shoulder line to your liking. There is a ratcheted front/back rotation and friction based outward joint at the shoulder to allow for a full 360 degree rotation of the arm and also allowing Gunfighter II to raise his arms out to the side in a tree pose. Please be careful of the rear view mirrors on the truck cab when utilizing this joint. The mirrors do not feel thin or breakable however they are probably the thinnest piece on the truck and I’d hate to see anyone damage them. A bicep swivel, single jointed elbow allowing for just past 90 degrees of bend, and a wrist swivel are also included. The hands are very similar to MP-10 with a single base hinge for all 4 fingers, and an extra joint in the index finger to allow for a more realistic trigger finger. I would have liked to see the index finger able to fully straighten out for pointing, however this is not possible with the current design. While not necessarily a point of articulation, Gunfighter’s chest can now open on this version, and you’ll find a gorgeous die-cast Matrix stored inside. For some reason the Matrix does appear to be stored upside down. I’m unsure if this is something that can be corrected at this point but if possible it would be nice to see that corrected before final release. Moving back to the articulation Gunfighter II has an ab crunch allowing for a decent range of movement, this is an excellent inclusion that is starting to become an industry standard for transforming figures. I’m very happy to see this trend spreading. Gunfighter II can twist at the waist, has universal ratcheting hips that can swing forward and back a healthy amount. Due to the design of the pelvis/waist area he is not able to kick straight forward but can achieve a very realistic walking/running pose. He can also swing his leg out to the side just one click shy of a full flat on the ground split. 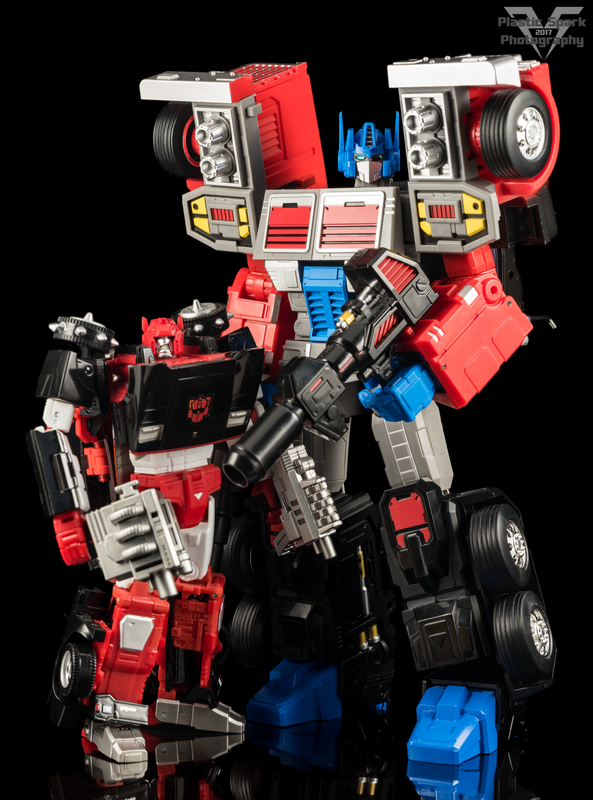 I have been advised by Fans Hobby that the thighs on the original Gunfighter figure were made of die-cast, and the new Gunfighter II figure has plastic thighs. I really don’t see this being a detriment and if anything probably allows for better articulation by keeping the legs lighter. Double jointed ratcheted knees allow for great running and combat poses and a fantastic inward ankle tilt allows you to keep Gunfighter’s feet firmly planted on the ground in almost any pose. The toes can bend downwards due to transformation, and you can also fold the heel spurs down slightly to support more dynamic poses. The feet are large and made of die cast working as a great base for this figure. For being a sample copy, I was expecting there to be some tolerance issues and possible QC concerns to overcome but quite honestly this figure feels finished. All the joints are tight, the ratchets are all working and feel great, and I was able to get Gunfighter II into pretty much any pose I could think of within the limits of his design. The large shoulder pauldrons certainly can cause some clearance issues when you are trying to achieve some more dynamic poses but the use of multiple hinges and points of articulation in the shoulders, chest, and arms allows you to overcome many perceived limitations. 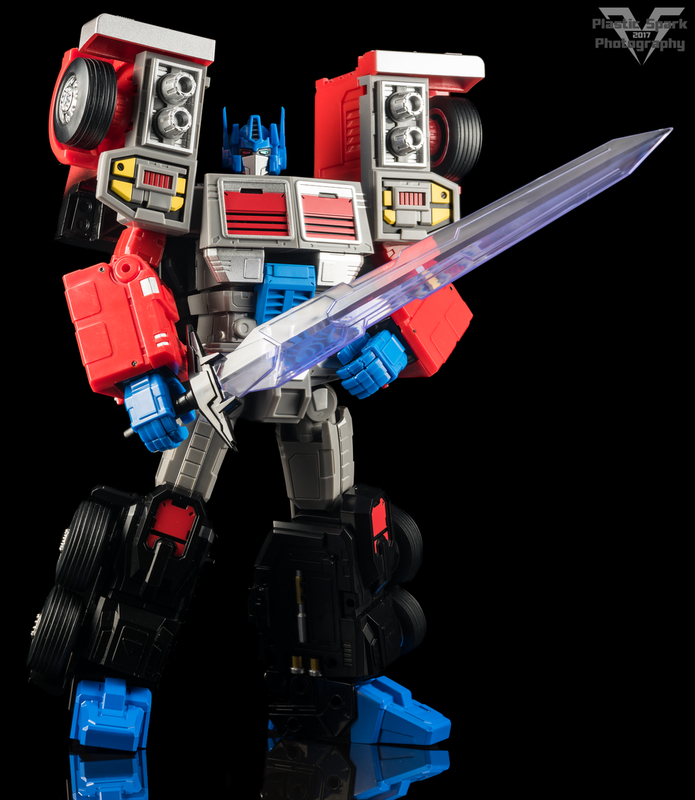 I had one articulation issue with this sample, for some reason the waist swivel will not rotate to the right, Prime’s left. There is a functioning waist swivel, and turning it to my left is easy as pie but something is keeping it from turning the other way. Likely a disassembly of the figure would reveal the cause, maybe just some flashing in the joint or something but likely not an issue that will affect the finished figure. The chest/ab section also separates ever so slightly, though this may be a feature to help accommodate the ab crunch. This is the first time I have ever been given the opportunity to check out a prerelease sample of a figure and Fans Hobby has impressed me greatly by sending out what truly feels like a finished figure. 1x Blaster Rifle – This blaster rifle is styled after G1 Optimus Prime’s original Ion Blaster. The blaster is covered in molded detail and has a nice number of paint apps to add some life to the weapon. This is a nice departure from a lot of plain single cast weapons with no paint that other companies include. 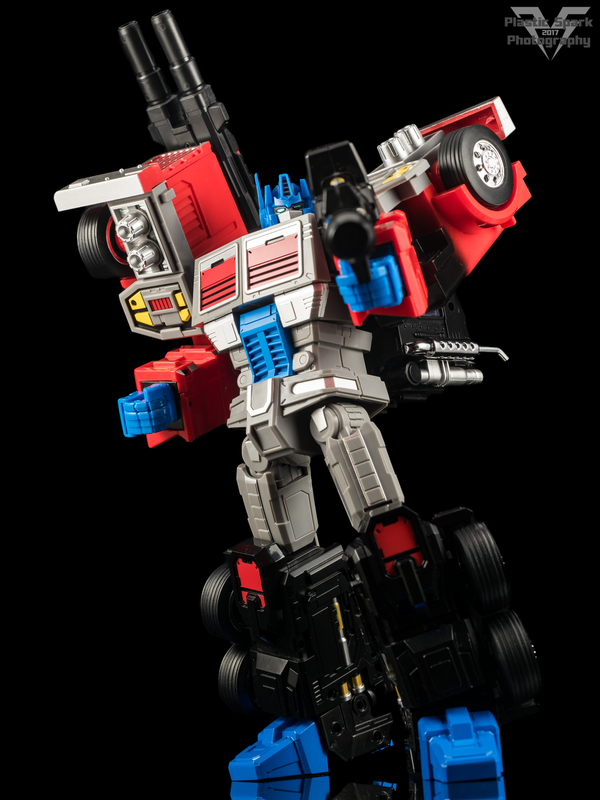 1x Double Barrel Blaster – Designed to resemble the blaster included with the original G2 Optimus Prime. We see some nice red paint apps on the sides again and some decent detailing. I personally really like to have it mounted on Gunfighter’s shoulder while he holds his rifle and sword to add even more height and firepower to his bot mode. On both guns the handles fold under and into the blaster to reveal a mounting port that can allow the gun to be stored in the flip out storage port hidden in Gunfighter’s shoulder/hood. Both weapons have a small grooved tab on the rear of the handles that slides into a slot in Gunfighter’s hands to allow for a secure connection. Both blasters sit a bit high in the hand due to Gunfighter’s thick forearms/wrists but this groove/slot system allows the weapons to still be held very firmly. 1x Energy Sword – Gunfighter’s energy sword is a massive blade moulded in a translucent crystal purple with a ton of awesome details sculpted into the blade. The handle of the sword is plain black and the blade can detach from the hilt. 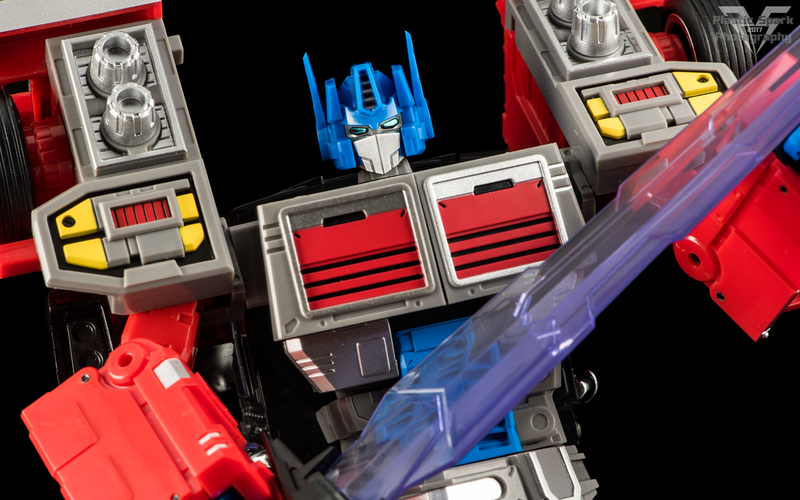 I am unsure if the blade detaching is a feature or just a side effect of assembly but it does allow Prime to store just the hilt to sell the illusion of it being an energy sword rather than a physical blade. The handle is round and can be a bit tougher to maneuver into Gunfighter’s hands compared to the flat handles of the blasters. The sword has the same tab molded on to the rear of the handle to allow it to be held securely in Gunfighter’s hands, and also features a small flip out peg in the cross guard to allow storage on Gunfighter’s back via the shoulder storage ports. 1x Matrix – A very nicely detailed and painted Matrix that comes contained within Gunfighter’s chest. This is a new addition for Gunfighter II. This is a gorgeous piece, and even though many collectors have a pile of these things by now I actually think this is one of the nicer examples. 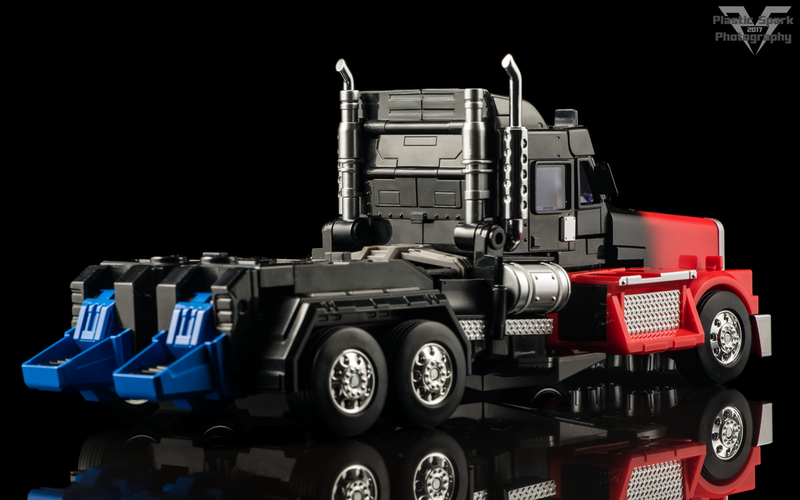 I actually think it looks even nicer than the one included with MP-10. Be careful when first opening the chest as the Matrix does not have any solid locking point and will fall out when the chest panels are opened. All said and done I am very impressed with Fans Hobby MB-04 Gunfighter II. This sample copy feels like a finished toy and what few nitpicks I may have are very minor. In my opinion Gunfighter II is on par with figures like MP-10 Optimus Prime and that is an achievement in itself. Tons of detail, tons of well applied paintwork, effective and on topic accessories, and a fun and enjoyable transformation all lend themselves to a really fun figure to have in hand. I do have some feedback on the figure. The articulation in some places could be improved, for example a butterfly joint in the shoulders would do wonders to help overcome the limitations of those shoulder pauldrons, and double jointed elbows are always something I like on my figures. 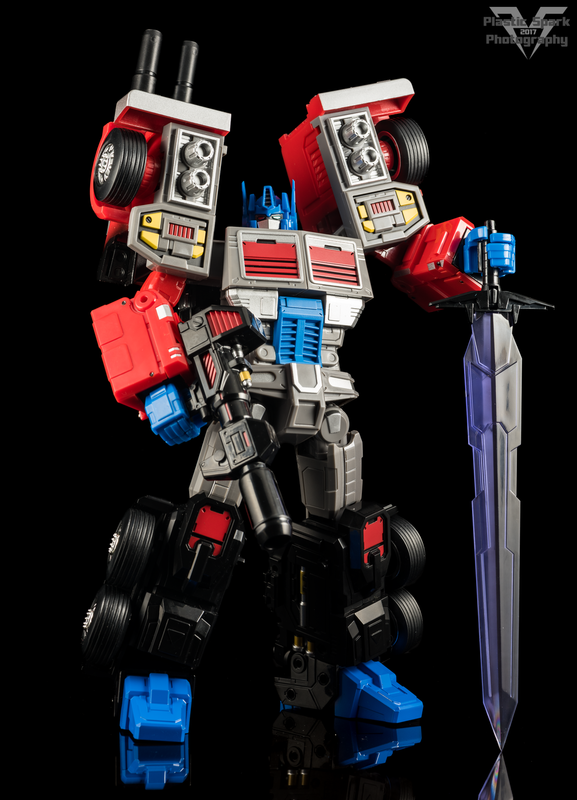 Compared to a figure like MP-10 the articulation is on par if not a little better, but looking at some of the newer figures like MP-36 Megatron and Gunfighter II may be found lacking. I look forward to seeing the future of Fans Hobby as they have a number of very exciting projects on the table right now. This is absolutely a company to keep an eye on. 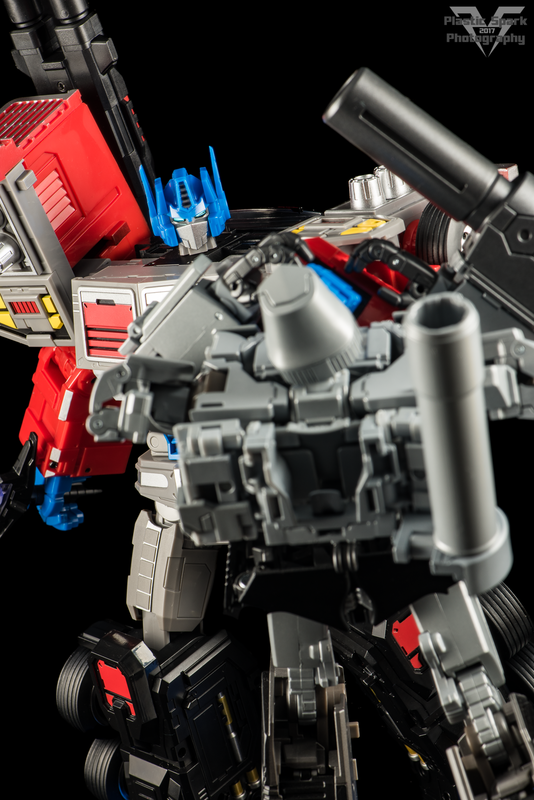 They are on their 4th release and they are already churning out figures very near the level of Takara mainline masterpiece figures. Finally I want to thank Fans Hobby for letting me check out Gunfighter II, I really appreciate that they reached out to me and allowed me this opportunity. If you like my review and photos of this product please reach out to them and let them know and hopefully I will be able to work with them some more in the future! As always thank you so much for taking the time to check out this review! 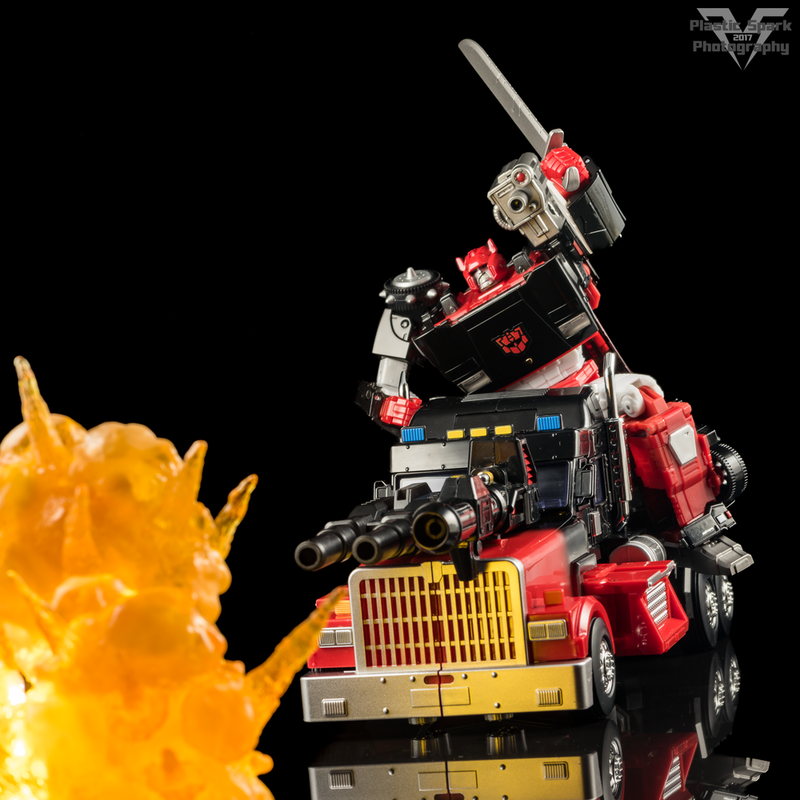 Please check out the full gallery below and make sure to scroll all the way to the bottom to see Gunfighter II take on MP-36 Megatron! Please let me know what you think in the comments or comment/message me on the Facebook page! You can also email me if you have any questions, requests, or critique at plasticsparkphotography@gmail.com! I'd love to hear your thoughts on MB-04 Gunfighter II from Fans Hobby and if you plan to add this figure to your collection!